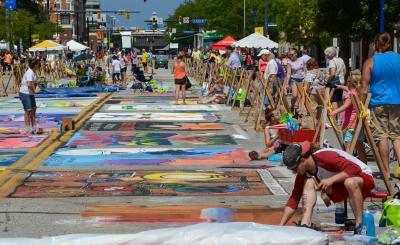 From the chalk walk at 9th Street all the way down to the mainstage at 4th Street, this year's edition of Celebrate Erie is brimming with activities. From Thursday, Aug. 16 to Sunday, Aug. 19, the streets of downtown Erie will see locally-sourced art, food, music, and culture for a weekend of free, family-friendly activities. Celebrate Erie is a different kind of festival. It's put on by the city, and more specifically, the mayor's office. The event began in 1976 under the guidance of Erie's then-mayor Lou Tullio. Of course then — as many will be eager to point out — it was known as "We Love Erie Days." We bet you dollars to Mighty Fine donuts that you still hear people still call it that too. It evolved throughout the years, and during the term of Rick Filippi, it was relaunched as "Celebrate Erie." Now, in the wake of the Sinnott administration, new mayor Joe Schember and his staff are hoping to inject even more local flavor into the festival. Taking a look at the full map and schedule for the festival at celebrateerie.com, one could expect it to taste like pepperoni balls and sponge candy — metaphorically speaking, of course. Still, the organizers of the festival, particularly Media and Events Coordinator Aaron Loncki, were already looking ahead as soon as they got into office. For all the shifts the festival has taken since last year (including a colorful and elegant new logo), Erieites can expect even more in 2019. Though the days are filled almost exclusively by local talents, the nights still called for a few big names from around the country (and one group of hometown heroes). The headliners will start off with the Erie All Stars, who will do a special set featuring the music of the late Tom Petty on Thursday night. Friday will reach across the western border to bring in the Ohio Players. You might be familiar with them thanks to hits like "Love Rollercoaster" and "Fire." The R&B Hall of Famers found great success in the mid-1970s, charting three platinum records between 1974 and 1975 alone. These days, the remaining members of the original lineup are guitarist Chet Willis, drummer James "Diamond" Williams, keyboardist Billy Beck, and percussionist Robert Jones, with many new talents in the mix as well. Saturday will feature arguably the most well-known name of the weekend, Sugar Ray. The California pop-rock quartet had quite a few hits in the late 1990s, like "Someday," "Every Morning," and "Fly." Frontman Mark McGrath became a celebrity in his own right thanks to reality TV and game shows like Don't Forget the Lyrics, Celebrity Big Brother, The Apprentice, and American Idol. Following the trend that the festival has followed in recent years, Sunday will be the more "country" day. To help that, duo Dan + Shay will close out the last day of the weekend. The pair has released three albums, with their third, eponymous record having come June 22, landing at the top of the U.S. Country charts. The "Dan" half of the group, Dan Smyers, has some regional roots, having spent most of his life in the Pittsburgh area, while Shay Mooney part grew up in Arkansas. The two are known for tracks such as "From the Ground Up," "19 You + Me," and this year's "Tequila." Aside from the last three headliners, the Highmark Mainstage will be all local acts. The Pennsylvania Lottery Stage, in west park stage at Perry Square will host a complete roster of local bands, as will the multicultural stage at East Seventh Street. The festival is organized into themed districts. 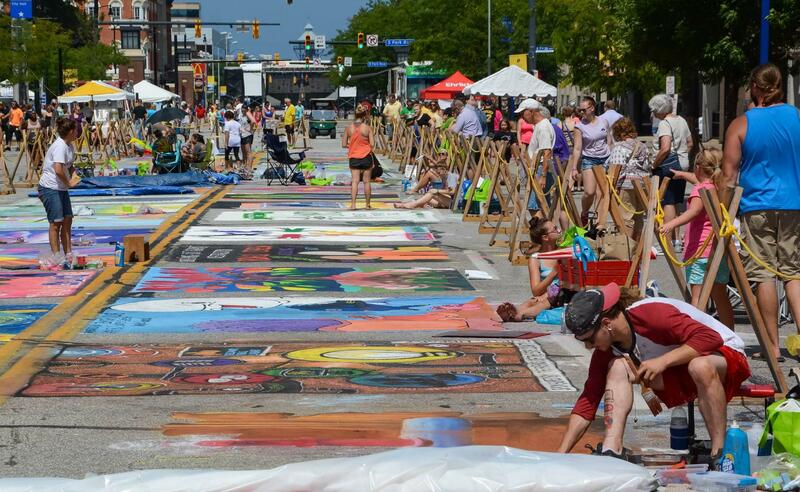 The UPMC Art District will include the ever-popular chalk walk, "artist alley" located around the Perry Square fountain, and the "kids zone" along East Fifth Street outside of the Erie Art Museum. The Culture District will include the Erie Insurance Multicultural Marketplace on State Street (from South Park Row to Seventh Street), with food, artisans and more from our diverse international communities (as well as the info tent). The Giant Eagle Food & Beverage District will house Taste of Erie on the west side of Perry Square, with nine local restaurants, ten local breweries, and beer purveyors being stationed around Perry Square. Eleven food trucks in total will be in the vicinity, with five along South Park Row at the edge of Perry Square, on North Park Row, and one in Artist's Alley. In addition to Taste of Erie, ten local restaurants and bars (as well as one downtown, locally-owned coffee shop) that surround the festivities will be partnered up with Celebrate Erie. The Highmark Music District is represented by the aforementioned Mainstage and the Pennsylvania Lottery Stages. State Street between Seventh and Eighth Street will be home to the Business District, with 19 local companies setting up booths. Aside from certified service animals, the festival does not permit dogs. Unlike years past, there is no fireworks display planned for 2018.